One in 15 babies born in Canada has what’s called an orphan disease. And even though there are more than 7,000 such diseases that affect over 300 million people globally, they’re considered rare. Major pharmaceutical companies generally concentrate on drugs that treat common conditions, so orphan diseases – most of which are genetic – haven’t been a priority, as their name suggests. Working with partners such as Halifax’s Agada Biosciences and the Vancouver-based Centre for Drug Research and Development, Dalhousie Medical School researchers are taking new orphan disease treatments from the lab and moving them to market. Through a project announced Tuesday (September 13), $3-million in funding from the Atlantic Canada Opportunities Agency will enable the development of drugs for muscular dystrophy, inherited Parkinson’s disease, and a rare childhood blinding disease called familial exudative vitreoretinopathy, or FEVR. Agada Biosciences and Dalhousie Medical Research Foundation also provided project support, making it worth a total of $4.5 million. 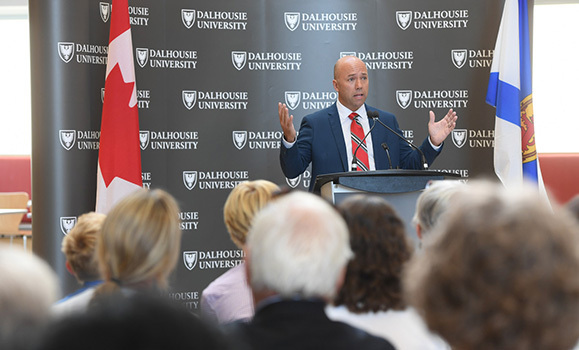 The zebrafish facility, located in Dalhousie’s Life Sciences Research Institute, will be key to advancing the drug discovery. Zebrafish share many genes with humans, so they’re excellent models for testing the safety and efficacy of treatments. The orphan disease drug discovery work will also result in the training of several highly qualified scientists with expertise in getting treatments from the laboratory to the medicine cabinet. 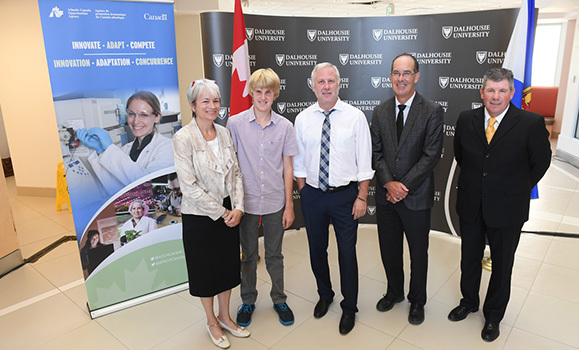 Left-to-right: Dr. Johane Robitaille (Department of Ophthalmology & Visual Sciences), Nick Gentleman (a young patient with FEVR), Dr. Chris McMaster, Dr. David Anderson (dean, Faculty of Medicine) and Stephen Hartlen (Dalhousie assistant vice-president of Industry Liaison and Innovation).